My first western short story was “Caught Red Handed” published by Western Digest of Calgary back in 1995. Douglas Sharp (Western Digest). He not only critiqued my work but challenged me to do more. He taught me to speak more western; for example, using (most likely) instead of probably; limit the use of ain’t in dialogue and cut down my use of commas. “Write the way people talk,” he said. Eventually Western Digest published seven of my short stories before ceasing publication. That’s how I got started in western fiction. Robert J. Randisi took a chance and included my story “Likker Money” in the anthology “White Hats” in 2002. That gave me a big boost. I’ve been trying to equal it since. I’m very grateful for that opportunity. Harry Drago – I love his factual authenticity. Louis L’Amour - A true master of fiction. It wasn’t a novel. It was the short story “Wine on the Desert” by Max Brand. The whole story is full of intense drama, very effective. Zane Grey’s “The Thundering Herd.” I was in high school at the time. Bat Masterson. Despite the call that he was a quick draw artist and killed untold numerous others, I believe history shows that he only shot and killed one man, in self-defense, after he was wounded by the same. Why do I like him? He was a standup guy that would not back down from anything. I believe that he did more good than his embellished gunslinger reputation shows. Bat, like Luke Short, was not a tall overbearing man but his demeanor and undoubtedly no-nonsense facial expressions and eye contact, when confronted, helped to make others think things over rather than push to conclude the outcome. I read a lot both historical and fiction. If it is old west 1850 through 1900 then I’m interested. I use the internet and Wikipedia. I read reviews. I go to libraries to look up facts. Haunting used book stores is a hobby that I’ll never get over. My desk is littered with historical findings. You have to get it right. Setting is a difficult thing, if not impossible, to talk about if you’ve never been to that locale. When reconstructing the past, I feel that it is my duty to at least get things historically correct even if it isn’t pretty. All those John Wayne westerns filmed in Monument Valley made good setting. I try to show who my character is and why he is there then build the story from there. Prologues will certainly set the stage to time and locale. I usually do not begin a story with a prologue. Mostly as I go. Each story requires different facts to support the setting. The cowboy era was different than the gold rush of 49. Both time periods had their share of miscreants but oh so different. 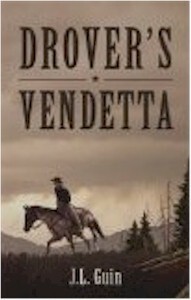 Charlie Cox “Drover’s Vendetta.” He is just an ordinary cowboy caught up in circumstance that inspires him to do things others would shy from. With a little luck he becomes a hero by just doing what he feels is the right thing to do. I don’t have a particular role model. If I had a wish it would be to emulate Charlie. I rarely outline a story. I let the story lead me where it goes. I usually have the beginning down pat and sometimes I know how it should end. The middle is the tough part. I am used to writing short stories; I write the whole story then edit to cut out the unnecessary. If I am working on a novel then I have to re-adjust, slow the story down in order to tie all the pertinent facts together without giving away or hurrying up the ending. I write conservatively following history, for time and place, as close as possible. My stories are set in the traditional old West. Its fiction so anything imaginable is fair game. The unexpected can be refreshing and necessary to the story as long as it can be made believable. Some of the stuff coming out lately has to do with vampires or science fiction. I’m not opposed to some of it. I just prefer to write about things the way they may have been traditionally. I don’t mind noise. I have been doing something, my whole life, while noise surrounded me. I’m usually alone in the room when I write. I can tune out what goes on in the house. When I was in the Navy I was aboard a destroyer. The ship’s motto was “This Can can do.” So whenever I think of writer’s block I just sit down; edit the story I’m writing to the point I’m stuck at. It helps to go to the beginning; by the time I get to the stopped part I usually can pick it up from there. Sometimes I’ll take a break from writing for hours or days even. The story doesn’t leave my mind though and often a new inspiration allows me to just get in there and get it done! 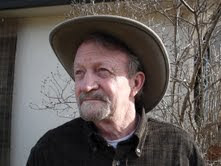 Colonel Ben Buffington in the short story “All the Water you Want” in the anthology Award Winning Tales. He’s so full of it he impresses no one but himself. Tyrel Sackett. Circumstance dictated his response. Brutality and bullying, in some way, are addressed in most of my stories. I will mention other touchy issues if they can be put in a favorable light for the victim. I’m still trying to learn how to do that. 18. Have you found that being able to self-publish through Kindle and Nook that you find yourself writing more of what you want rather than what the agent, editor, and publisher wants? Yes, somewhat. It is disheartening to sit and wait on editors, hoping that you have a chance but often do not even get a reply other than a printed form letter. I’ve a novel set in 1853 titled “River Whiskey” that has sat for over a year at a publisher without word one way or the other. Self-publishing is okay but you have to promote the work yourself. It is much more satisfying to successfully write a given assignment and then see it in print. I’m compelled to write but I guess I never considered that I could make enough to live off the proceeds alone. I’m still learning. My day job was as a wholesale lumber trader. I was fortunate enough to work for three different sawmills and made a decent living for my family for 30 years. I later managed a propane distribution plant for a few years before I retired. A novel about an 1870’s cowboy who collects on a bounty then learns there has been a bounty put out on him in return. I can’t get enough of the Old West. Western history is our heritage. I like to see how western fiction is imagined then put to life. I began by trying out the magazine markets then short story anthologies and decided that I would like to give it a try and work my way into novels. So here I am.